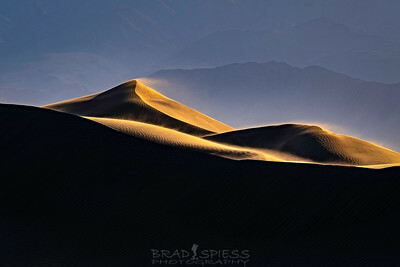 Sunset glowing on the blowing sand off of the tops of Sand Dunes in the Mesquite Flat Sand Dunes in Death Valley National Park. 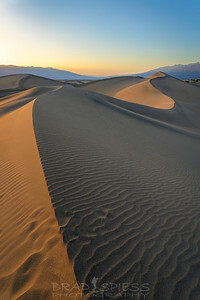 Sunset on the Mesquite Flat Sand Dunes in Death Valley National Park. 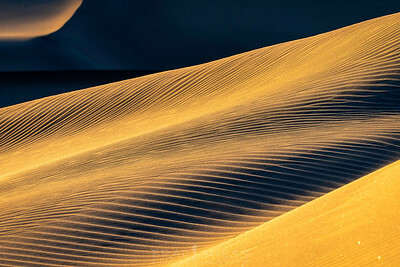 Sunset making the ripples of sand in the Mesquite Flat Sand Dunes of Death Valley National Park Glow. 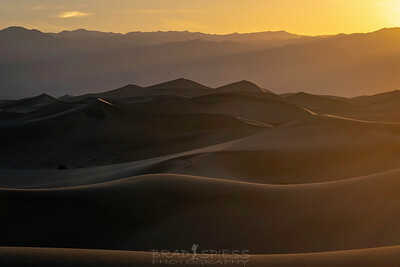 Sunset on the Mesquite Flat Sand Dunes of Death Valley National Park. 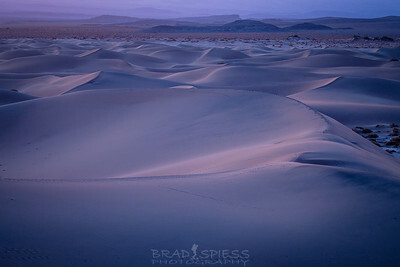 Blue hour during sunrise in the Mesquite Flat Sand Dunes in Death Valley National Park. 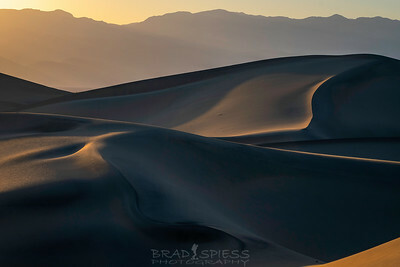 Sunrise lighting up the western mountains in the distance behind the Mesquite Flat Sand Dunes in Death Valley National Park. 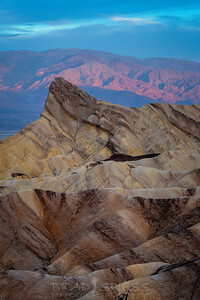 The Grand Stand is large outcrop of rock in the Racetrack Playa of the Death Valley National Park. 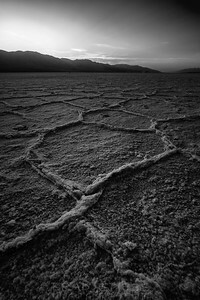 It sits in the middle of the northern section of the dry lake. 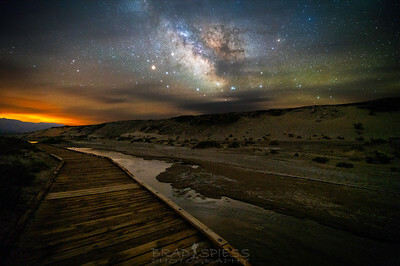 This is an extremely dark area of the park and allows you to really capture great images of the Milky Way. 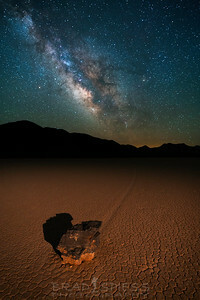 One of the moving rocks on the famous Racetrack Playa in Death Valley National Park. This was taken around 4am which is why you see the Milky Way at such a steep angle behind the rock. 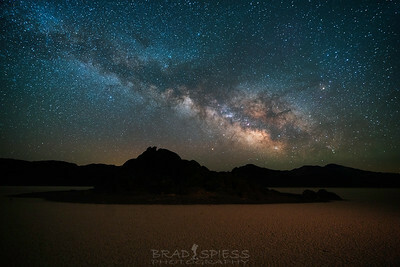 Usually early in the Milky Way season the Milky Way will start to be visible almost horizontal to the horizon as it gets dark enough and then become more vertical as time moves on during the night. 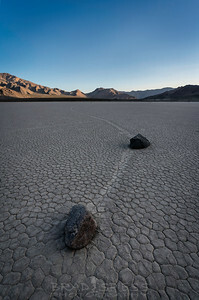 The traveling rocks of the "Racetrack Playa" in the Death Valley National Park. 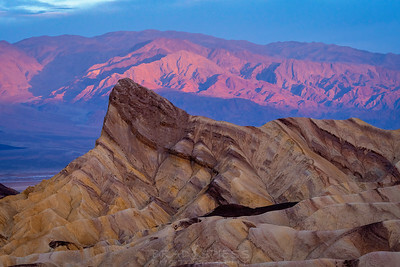 This area is famous in Death Valley for the mystery of the moving rocks. For years people where not sure exactly how these rocks moved over time. In 2013 a team of scientists from UCSD in San Diego did a study and found out that when a thin lake of water forms in winter and freezes, as it starts to melt, ice sheets will be moved by a small amount of wind and as the sheets move they also move the rocks near them and end up creating the trails behind the rocks. 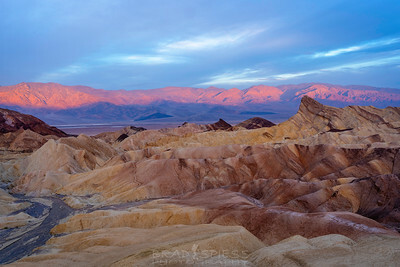 Salt Creek in Death Valley National Park. This seasonal stream of salty water is the only home of the rare Salt Creek Pupfish. We came here during the day time to check out this site and thought it would make a cool site for a Milky Way shot. 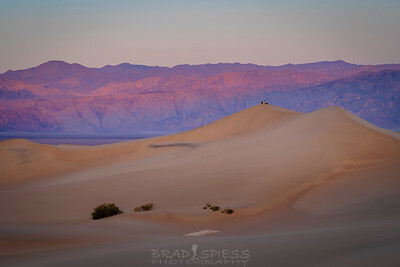 When we did that there where no clouds in the sky, when we got up at 3am to go shoot clouds had started moving in, and by the time the sun rose in the morning the clouds had fully moved in. The glow you see off to the left is the glow from the lights of Las Vegas, about 2 hours east of this site. 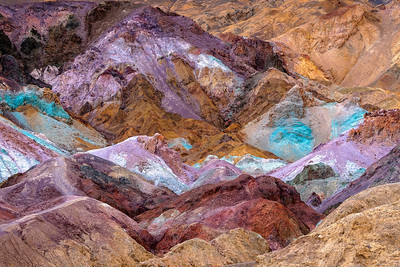 This is Artist Pallet in Death Valley National Park. All the colors mashed up togther like this made me think of a messy ice cream sundae like you use to get at 31 flavors baskin robbins ice cream shops. These colors are caused by the oxidation of different metals ( iron compounds produce red, pink and yellow, decomposition of tuff-derived mica produces green, and maganese produces purple).